I learned as a young, 18-year-old college student that sleep deprivation is common among college students. With the demands of studying, strict deadlines, and pressure of impending grades and the easily affected GPA, it’s easy to see why so many college students are addicted to caffeine. So, after becoming a mother, I pretty much accepted that I would never sleep when classes are in session. Some people recommend that you take only part-time classes while your baby is young, but since I’m a senior, I’m honestly just ready to be done. So, as a full-time college senior with a baby under six months old, the pressure is on! I’ve compiled a list of the top tips to help all my other (awesome!) college parents out. Pre-baby, I would sometimes wait until the very last hour to even begin an assignment. Smart? No. But, I knew that if I sat down and worked on it (unless something crazy and way out of the ordinary happened) I would be able to get it done. My parents honestly should’ve given me the middle name “procrastination” because I am horrible at it! You honestly have to say goodbye to those days as a college mommy, though. Especially with a baby as young as mine, the demands are extremely high. He needs me to feed him, entertain him, put him to sleep, change his diaper, and so much more. I am given regular assignments a week in advance, and I recommend taking all of that week to work on it little by little. Because you and I both know that there’s no way you’re writing a 10-page paper on the civil war with a cranky, and teething, baby in one sitting. As an online student, I have much more freedom than the traditional on-campus student. (Honestly cannot imagine how you’d be a campus student and parent!!!) But, alas, there are some assignments that have time limits. Weekly quizzes, for example, have a time limit of 30 minutes. This is enough time to take the quiz, no more, no less. Nap time is just too risky to take a quiz (God forbid little A wakes up in the middle of an extremely important exam), so you have to plan. Tell somebody (whether it be your parents, your partner, etc) that you need a certain amount of time per week to do schoolwork. I like to go back into a bedroom to really get studying done while the boys hang out together for a couple of hours. 4 months into life and little A is already a little book baby! The times that we actually read the hard board baby books is few and far between. Since he was in utero, he’s been listening to me read about psychological theories, and algebra equations. 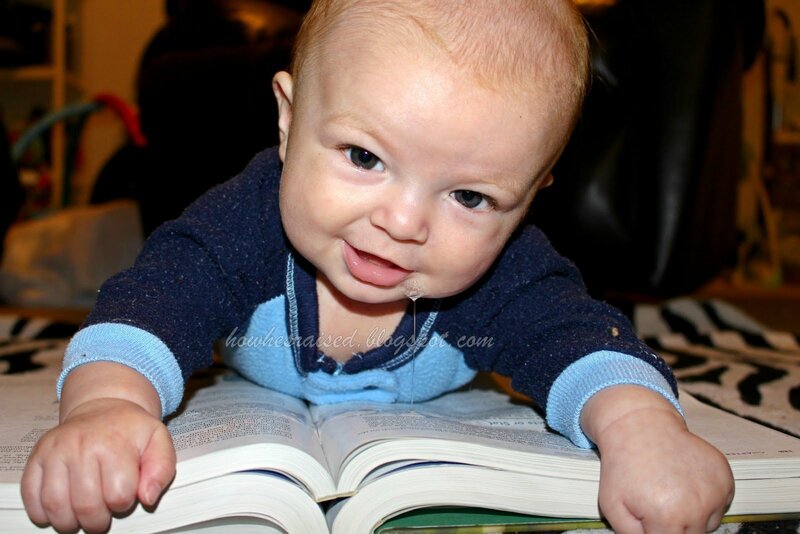 As long as you have some eye contact, and read in a fun voice, babies will listen to anything! Little A will lay there sometimes for up to an hour just listening to me blabber on. I can’t imagine it’s doing anything but good, and it gives me the ability to get my homework done! It should go without saying but sometimes we, as moms, need to be reminded that it’s okay to sleep. Once again, allot some time for you to get some sleep. You will be a better mother and student because of it. All in all, just hang in there. These days won’t last forever, and one day you will look back in amazement and pride at yourself. And remember, you’re doing this to make life better for you, your family, and your baby. Savannah is a full-time mom of one, and can often be found outside on one of her various adventures. She enjoys carving her own path through natural and holistic living, as well as discovering ways to use food as medicine.